"Opt Out Tools" are set of extensions to reduce user tracking. For instance, Google Analytics Opt-out asks the Analytics script to prevent logging the user. Note that this is not an adblocker extension. It just asks the Google Analytics API that the user is not willing to be recorded. 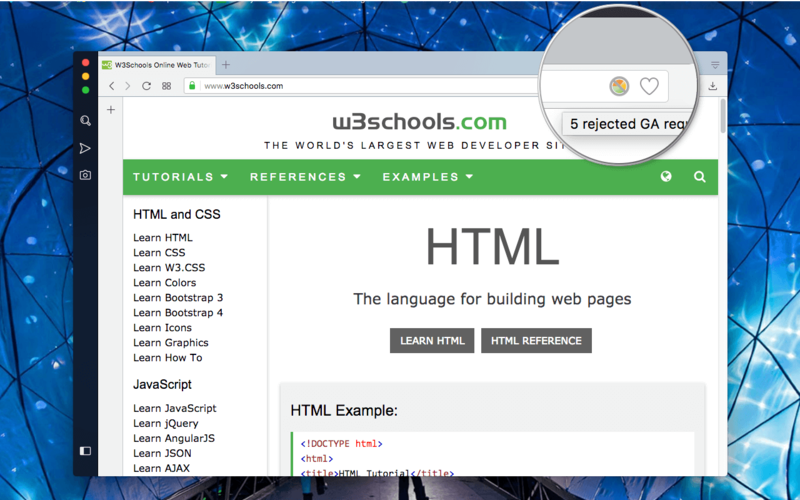 When one or more requests are being blocked for a web page, a page action button is placed in the toolbar or address bar area. Place your mouse over the button to see the number of rejected requests. What is the "Google Analytics Opt-out" extension and how does it work? This tool is meant to prevent Google Analytics from tracking the user. Basically, the extension injects a simple configuration object to each page that requests from the Analytics script from turning itself off. So unlike adblocker scripts that add a web request observer and block the analytics script from being fetched by the browser, this addon is not going to intercept web requests at all. It only asks the script to not record the current user. Why does this extension need to access my browser history? The extension needs to inject an object to each page to prevent the Analytics script from recording the user. To allow the extension to inject this object, you will need to allow the extension to access all hostnames. How can I find if a website has the Analytics script? This extension displays a page action button for web pages that request tracking. In Firefox and Opera the button is added to the right-side of the address bar and in Chrome it is added to the toolbar area. When the button is colorful, it means at least one tracking code is already requested by one of the page frames. To see the total number of Analytics requests place your mouse over the toolbar button.